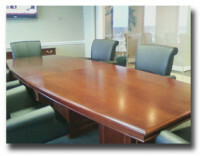 Custom Conference Table with Boat Shaped Top. 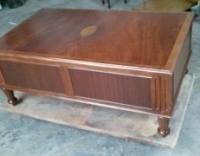 Table was finished in Mahogany. 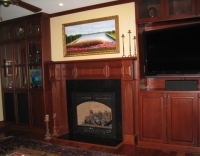 The entertainment center was color matched and custom sized to the customers’ specification. Details include fluted edges on the towers, raised panels, fabric insets in some of the doors and glass doors. 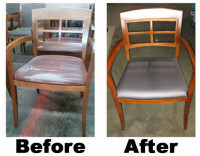 Refinished chairs for client. Extended the life of a high quality wood chair. 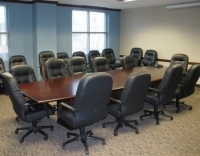 Saved client money and chair from being disposed of. 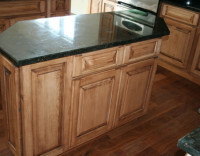 This kitchen project started with a custom reconfigured CAD floor plan drawing. The new floor plan enabled the home owner to maximize space and work flow. 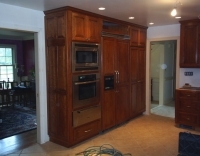 After the cabinets were built and installed the kitchen has a modern feel and better matches the clients decorative taste. 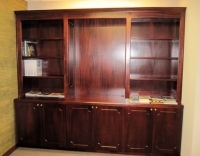 Customer had a waiting room with a need for storage instead of putting a freestanding bookcase they maximized the space by building built-in cabinets. 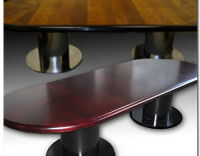 They were color matched to existing furniture. 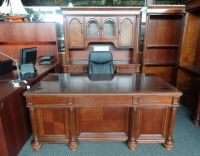 Customer need a Heckman Table Restored. 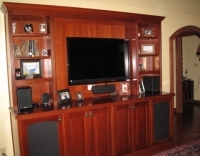 The entertainment center was color matched and custom sized to the customers’ specification. Details include fluted edges on the towers, raised panels, fabric insets in two of the doors and three shelves in each tower. 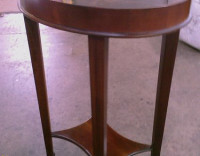 Client had a set of legs and wanted to make a table to put the legs on. 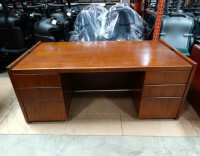 The Desk Doctor made a table that matched perfectly. 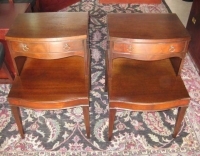 Bedroom Furniture Refinished and restored to like new condition.